Sometimes in a toy line, toys don't make it out-- they get canceled, or substandard distribution resulting in international or internet exclusives. Right now it looks like Gold Bumblebee is one of these figures, as roughly 17 Transformers toys originally slated for a US release between November 2010 and Spring 2011 never made it to domestic retail shelves-- seemingly no drug stores, Wal-Marts, Kmarts, and so on. Some of these did get out internationally, but if you live in the USA your only option was to shop online or if you lucked into a few of them at a deep discount at, for example, Marshall's stores. 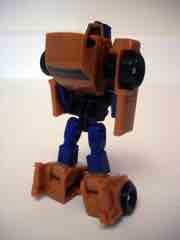 A shame, as of the 17 figures, 11 were entirely or partially new molds. Not-Goldbug here is a repaint. 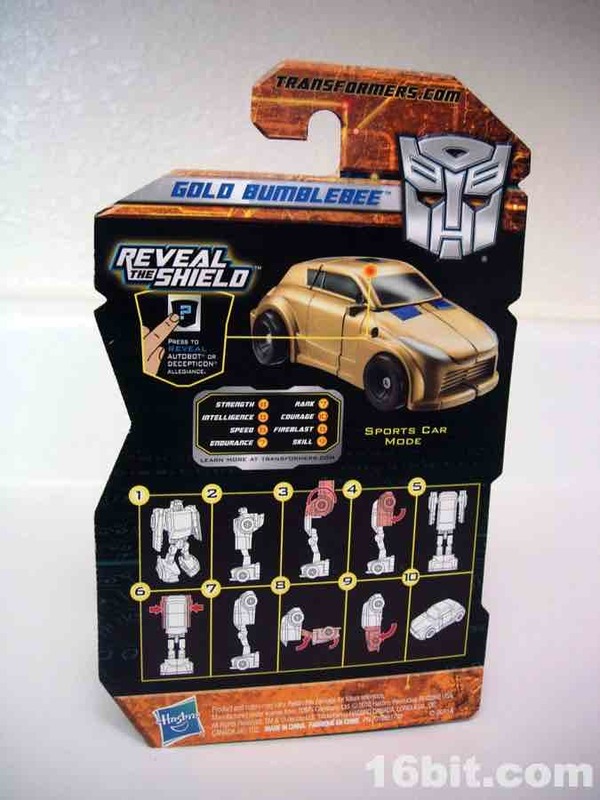 Hasbro hasn't released a proper Goldbug toy at retail since the original, and this is the first mass-market toy inspired by the character in years. 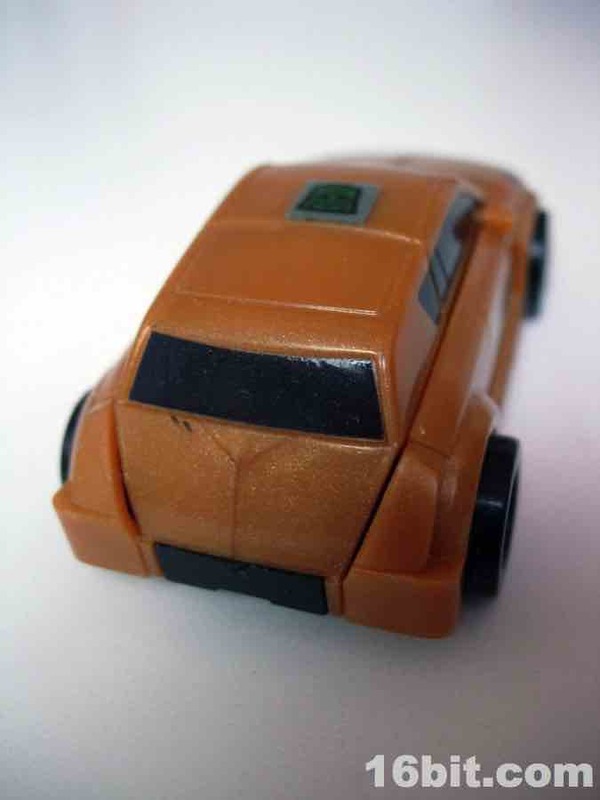 During Generation 2 Hasbro had a vac-metal gold Bumblbee repaint, and for Botcon 2008 there was a "Shattered Glass" Goldbug figure. And now we've got this guy, which in terms of coloring and transformation is very similar to the original despite not having the unique head. 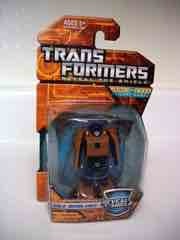 It's just a straight-up Bumblebee repaint with a head-sensitive sticker on his chest. Articulated at the ankles, shoulders, and hips, it's a pretty simple figure and one pretty much anybody could more or less enjoy. 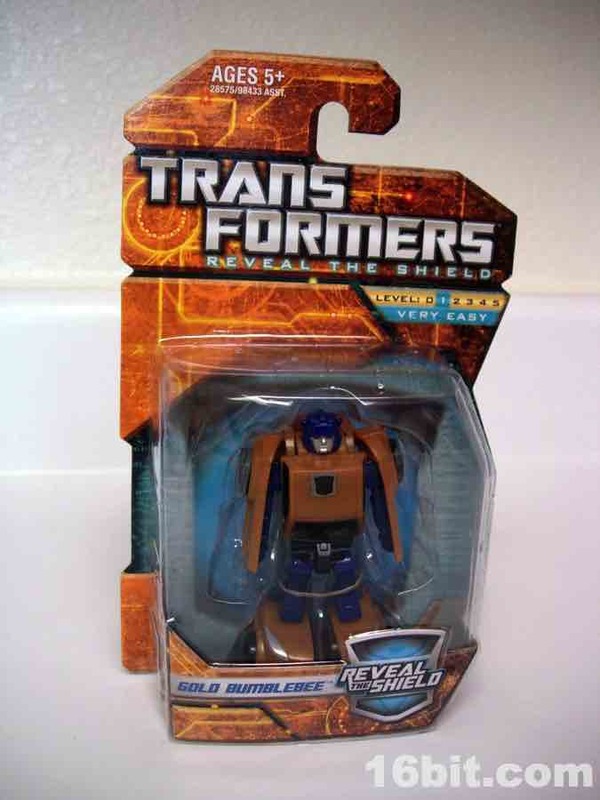 Bolded almost entirely in gold plastic with some black elements, Hasbro painted a few places blue to complete the look of the original toy. Transformation from robot to car is easy, as you just fold up the lower waist, push the front of the car into place, rotate back the back of the vehicle, and rotate the arms into position. 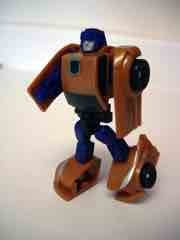 Mine had an arm that was stuck but Brute Force got it where it needed to be. 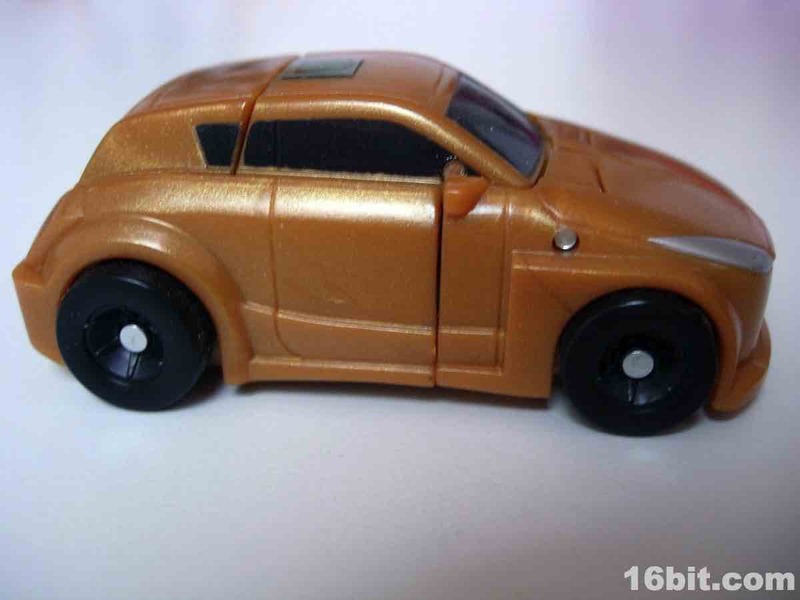 The car looks sort of like G1 Goldbug, minus the... well, OK, it's just the same color. It's a different kind of car now since Hasbro has been told not to do Volkswagon-esque vehicles, and it's pretty cool. As repaints go, it's really neat and if you're a big fan of Season 3 characters and toys like I am, you'll want to get this. 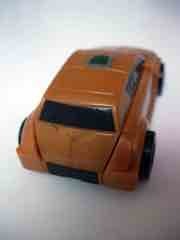 Even though this is the third of four decoes on the mold (Universe had G1, Henkei! 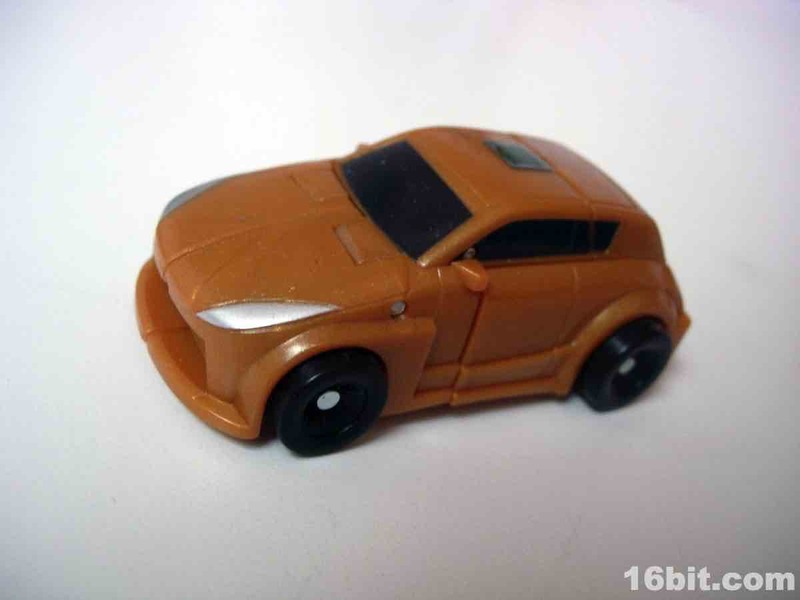 had Cliffjumper colors, and DOTM has a War for Cybertron-inspired motif), it's a unique remake referencing a different toy so I'd say, price permitting, you should get one. If you stumble on it, don't think twice about getting it as it's totally worth the five bucks. Interestingly, despite crushingly poor distribution, the toy's secondary market prices remained somewhat low even prior to showing up on closeout shelves. An interesting note: the figure doesn't match the early product shots, and as far as can be told there may be some variations on deco out there. 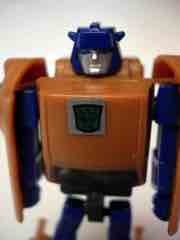 This sample has painted blue legs, while Hasbro's shots show them as gold.